Originally published as part of the acclaimed Sheffield Guides series, this helpful study guide is designed to meet the needs of students and general readers in a concise, accessible and affordable format. The contents of this introduction do not mirror the progression of the themes of the book of Amos itself. The reader starts near the end with reports of Amos's visions and the question of his status, and moves to Israel in the context of its neighbours. The reader is then invited to turn to more general discussion of literary issues in Amos. 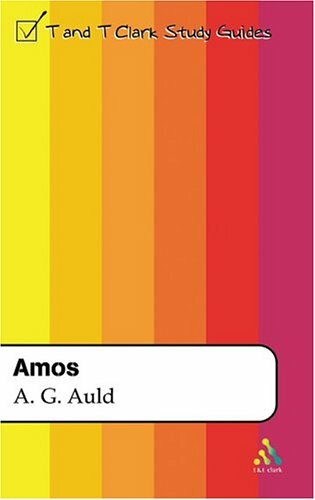 Only then is the familiar starting point of Amos's social and religious critique handled, while a final chapter assesses the wider religious and theological significance of the book. Amos : T & T Clark Study Guides by A. Graeme Auld was published by T&T Clark Ltd in September 2004 and is our 25192nd best seller. The ISBN for Amos : T & T Clark Study Guides is 9780567084972. Be the first to review Amos : T & T Clark Study Guides! Got a question? No problem! Just click here to ask us about Amos : T & T Clark Study Guides.